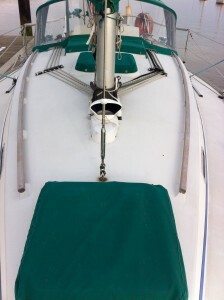 BUILD: – Deep fin keel aft cockpit sloop. 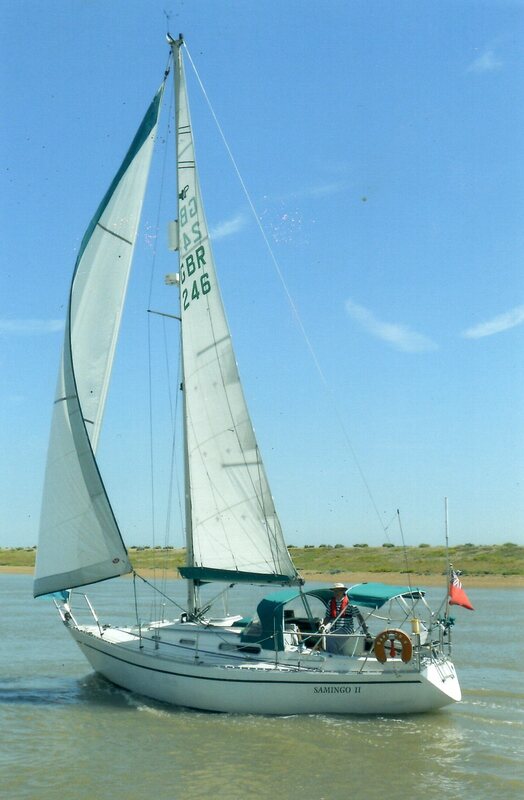 Designed by David Sadler and built by Sadler yachts in 1986, launched 1987. SSR Registered. 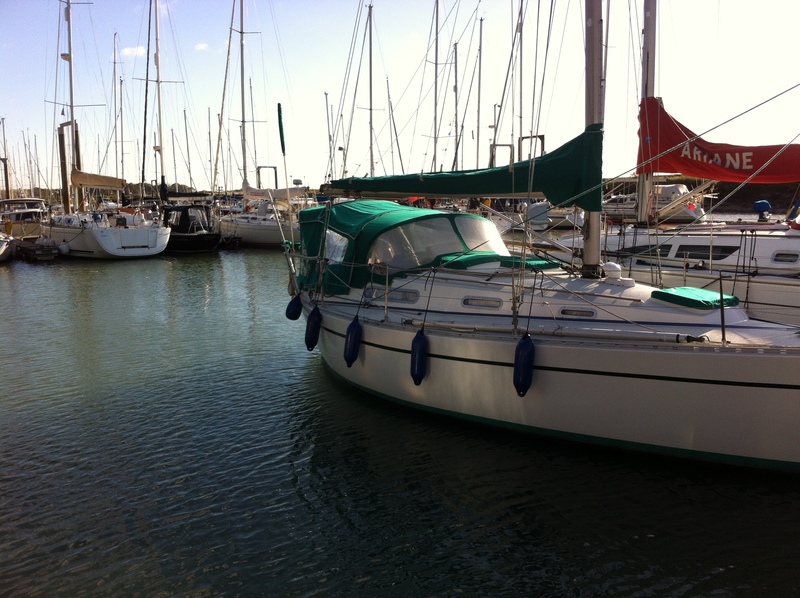 CONTRUCTION: – white GRP hull epoxied and fully restored below the water line. 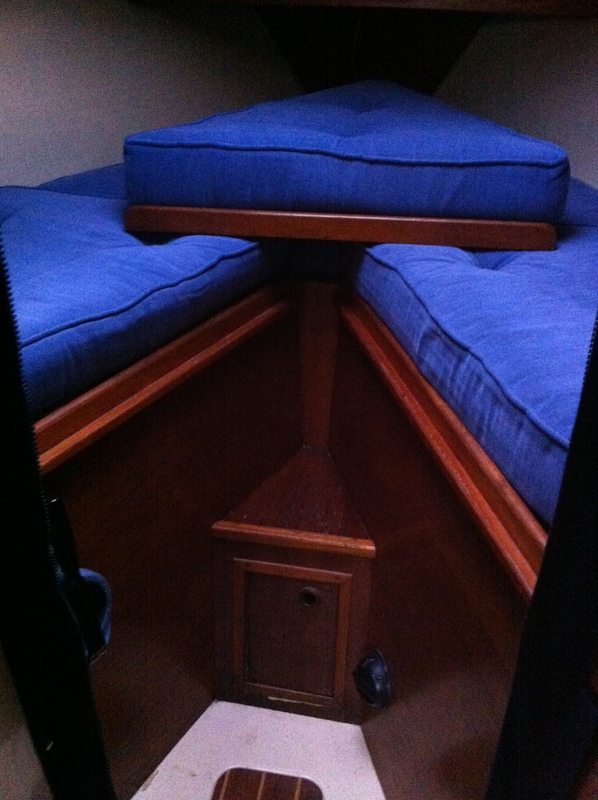 Toe rail completely removed and rebedded. Top sides stripped, fully restored and re sprayed. December 2011 to June 2013. Grey deck superstructure moulded on non-slip deck surfaces. 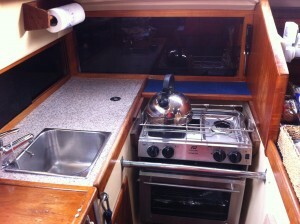 GRP interior moulding with teak and holly faced marine ply joinery with Corian work surfaces to the galley area. Bolt on cast iron keel. Skeg hung rudder with tiller (new 2011) steering. 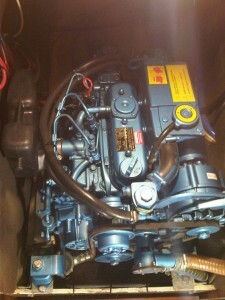 ENGINE: – Nanni 29 hp diesel engine (new 2009). Seawater cooling. Mounts new 2009. Single lever controls. 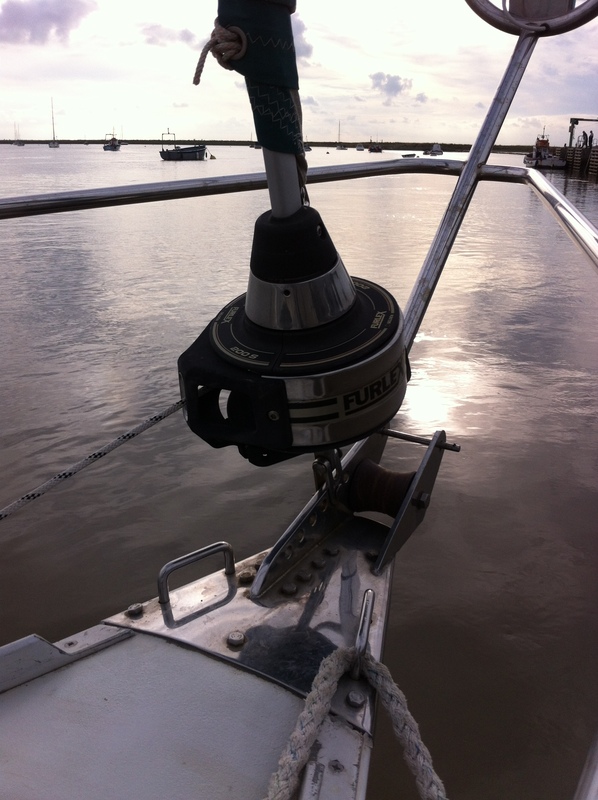 Direct drive to a two bladed bronze folding propeller. Electric starting. Professionally serviced from new. 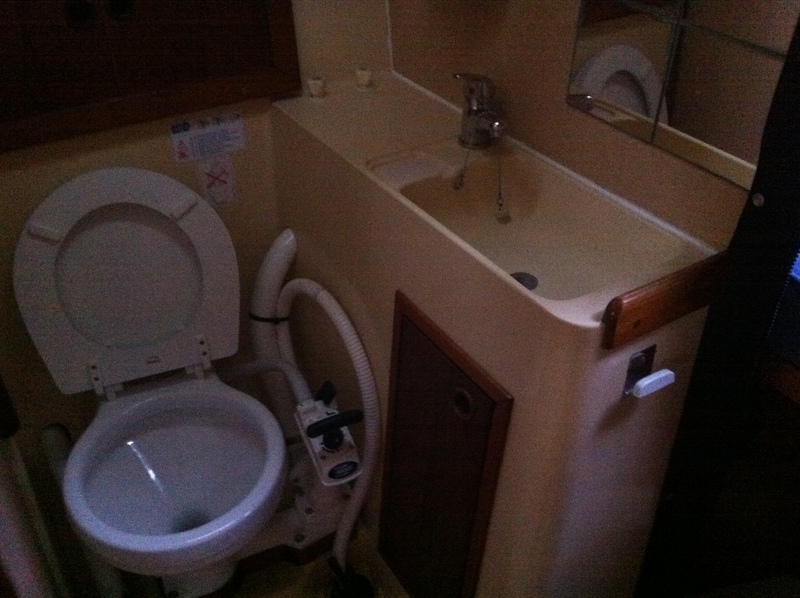 TANKAGE: – 17 gallon steel fuel tank in cockpit locker. 22 gallon (two) stainless steel fresh water tanks (new 2013). 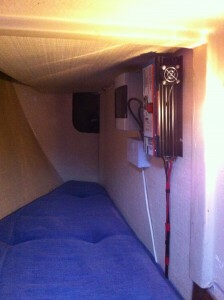 ELECTRICS: – 12V System. Two 12v batteries (new 2010) charged by engine alternator. 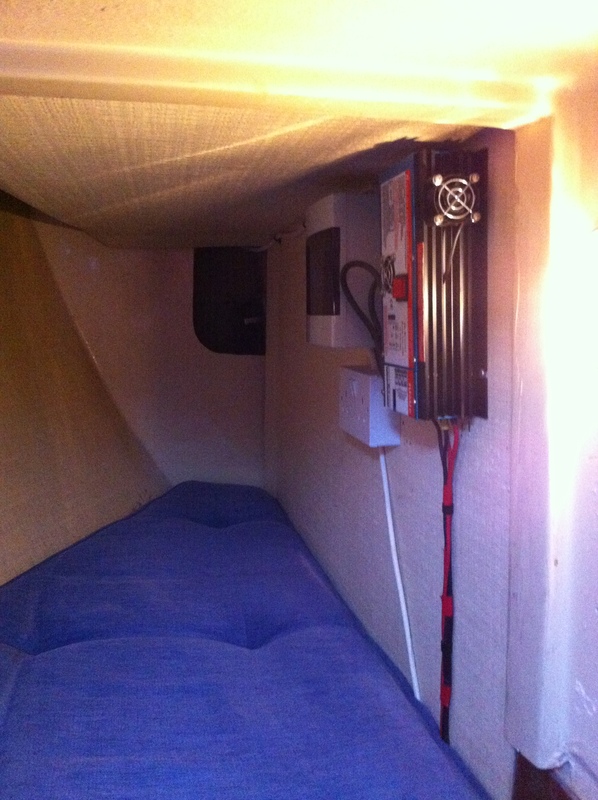 12v lighting throughout. 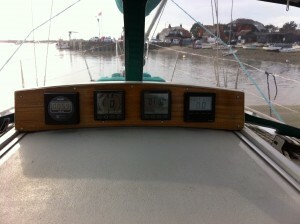 Bow, stern, steaming, deck and tri-colour lights. 240V System. 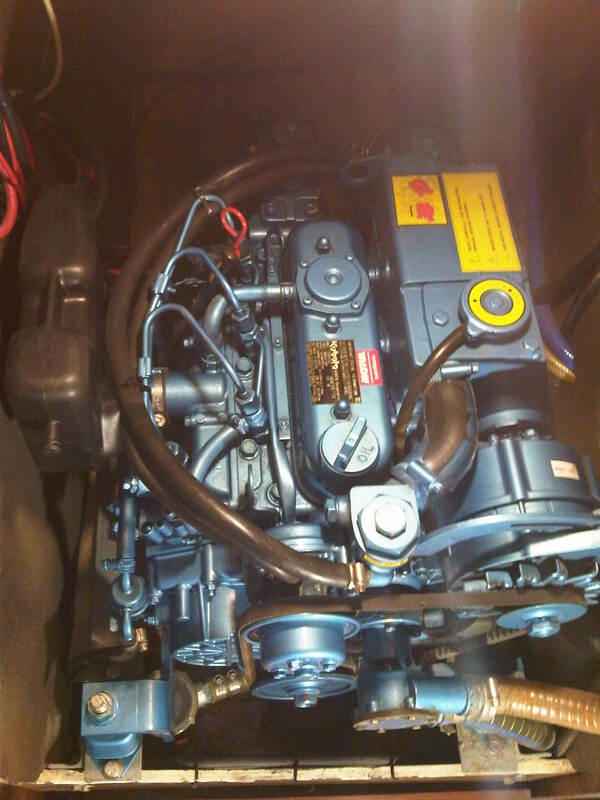 Shorepower connection wired to battery charger and cabin sockets. 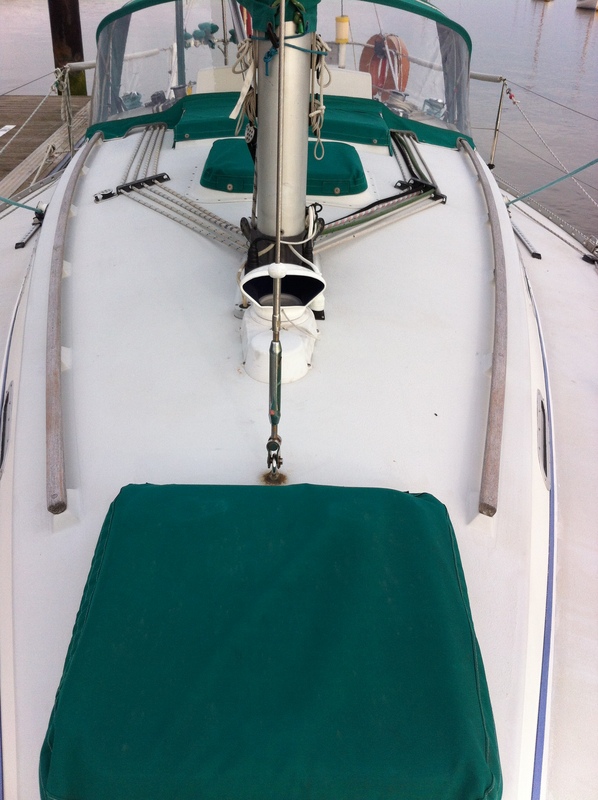 SPARS & RIGGING: – Masthead Bermudan sloop with Kemp silver anodised alloy deck stepped mast, slab reefing boom and spinnaker pole. Rod kicker. Furlex Furling gear (new 2009). Standing rigging outers replaced 2005 and checked every year (mast taken off each winter). Inners replaced 2010. 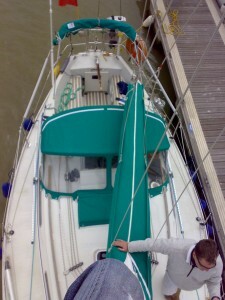 Terylene running rigging partially replaced as necessary led aft to cockpit jammers. 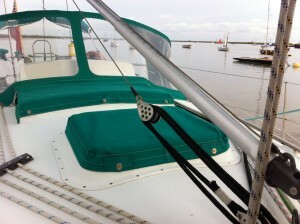 Backstay adjuster. 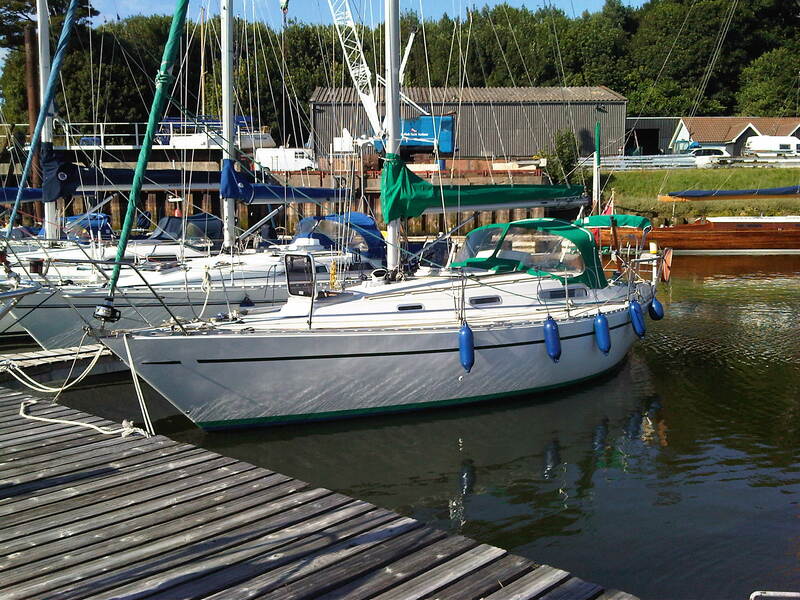 2 x Barlow s/t 25 two speed primary winches, 1 x 19 and 1 x 16 halyard winches. and re stitched 2013 also with new straps. Original Triradial spinnaker, main and two furling genoas. NAVIGATION EQUIPMENT: – Navman Tracker 5605, JRC LCD Radar 1000, Garmin GPS 120, Seafarer Depth Voyager, Furuno Navtex NX-300, Silva S10 Fixed VHF Class D DSC Radio, Clipper wind, Clipper GPS Repeater, Autohelm Speed, 2 Autohelm 2000ST (one spare never used in original box). Echomax Active –XS- Duel Band Radar Target Enhancer. 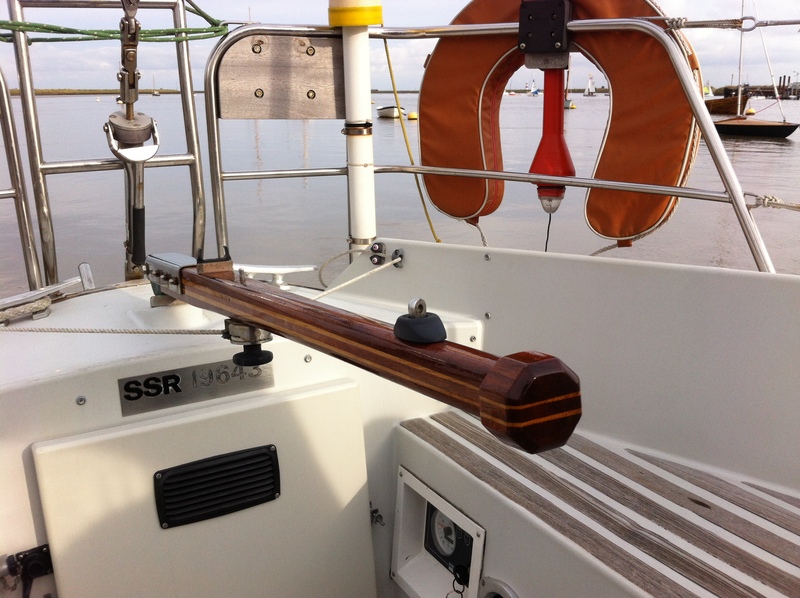 AIS Simrad A150 Class B AIS Transponder & Receiver. Nearly all instruments have been replaced in current ownership. Not Included. SAFETY EQUIPEMNT: – 2 x cockpit harness points. 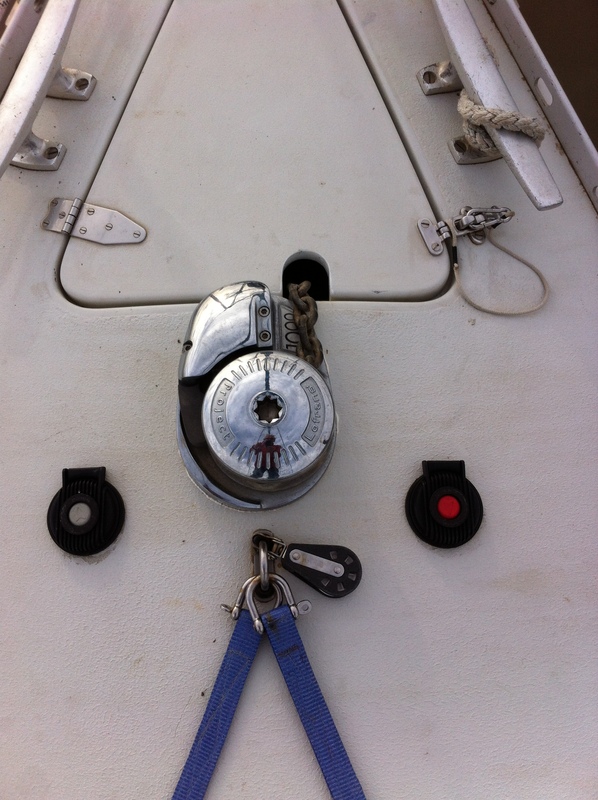 Lifebuoy, Dan buoy, webbing jackstays, fire extinguishers, radar reflector (new 2009), 2 x manual bilge pumps. Plastimo Cruiser 4 Life Raft (not included). ACCOMMODATION: – 5/6 berths in two cabins. 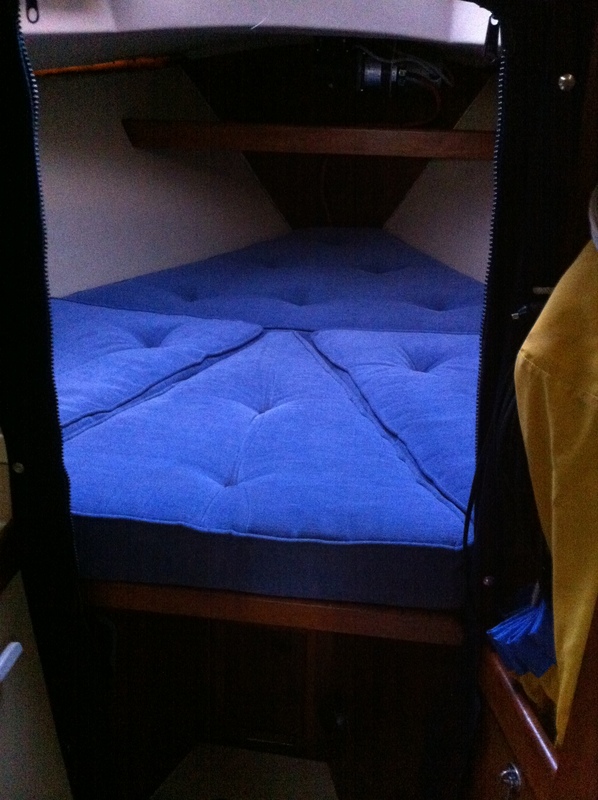 V berth forward with infill. Separate heads with moulded in GRP washbasin, manual fresh water pump and jabasco operated sea type WC (new 2013 with plumbing). Hanging locker opposite heads. Saloon with U shaped settee to port (converting to a double) and settee berth to starboard. 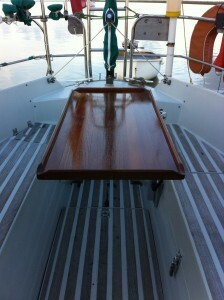 Large Table with drinks stowage. Galley to port with Plastimo Cooker with oven and grill (new 2009) with gas replumbed + isolation switch, s/steel sink, pressurised hot and cold water to galley and heads, fridge and good stowage. 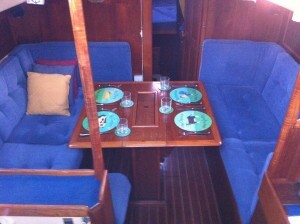 Large chart table to starboard with quarter berth behind. 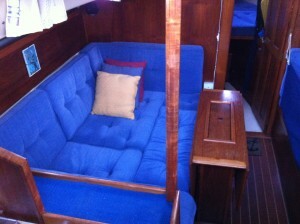 Teak and holly cabin sole, mid blue tweed type upholstery (new 2003) in good condition, curtains. Eberspacher diesel fired warm air cabin heating. Radio CD Stereo (new 2008). DECK EQUIPMENT: – S/steel pulpit, stern guard, stanchions and guard wires (new 2009). Stern mounted folding berthing ladder. 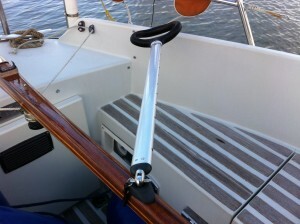 Single bow roller with fairleads. Lofrans electric windlass (new 2009). 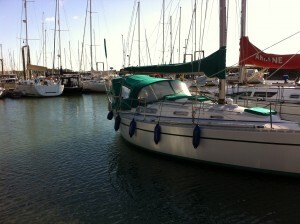 Plough Anchor and 40m chain (new 2010). 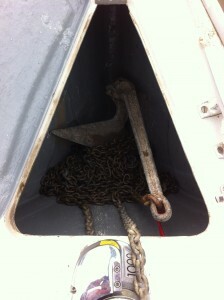 Danforth kedge anchor chain & warp (not included). 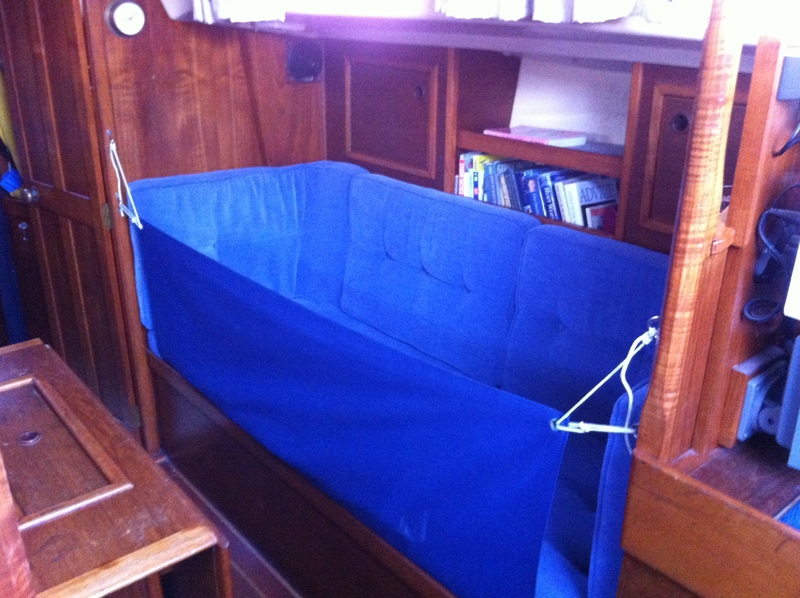 Large self-draining anchor locker. 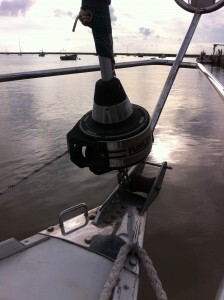 Bow, spring and stern mooring cleats. 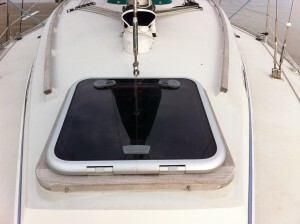 Opening internally and externally plastimo deck hatches to forecabin and saloon (new 2009). Tannoy vent to heads. 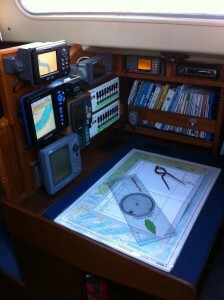 Genoa track and cars, mainsheet track and traveller. 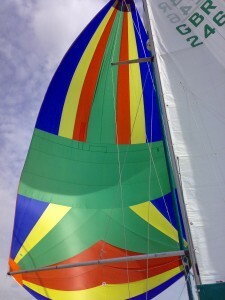 Spray Hood and Full Cockpit Canopy/Tent that converts to a bimini (new 2010). 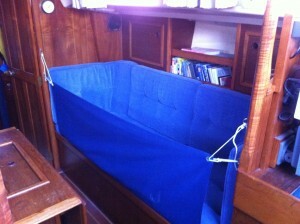 Canvas covers for 2 hatches (new 2009). Tiller cover. Draining gas locker (also with isolator switch underneath cooker). Life raft stowage under cockpit sole. 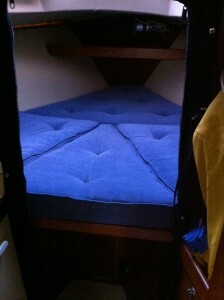 Large cockpit locker. 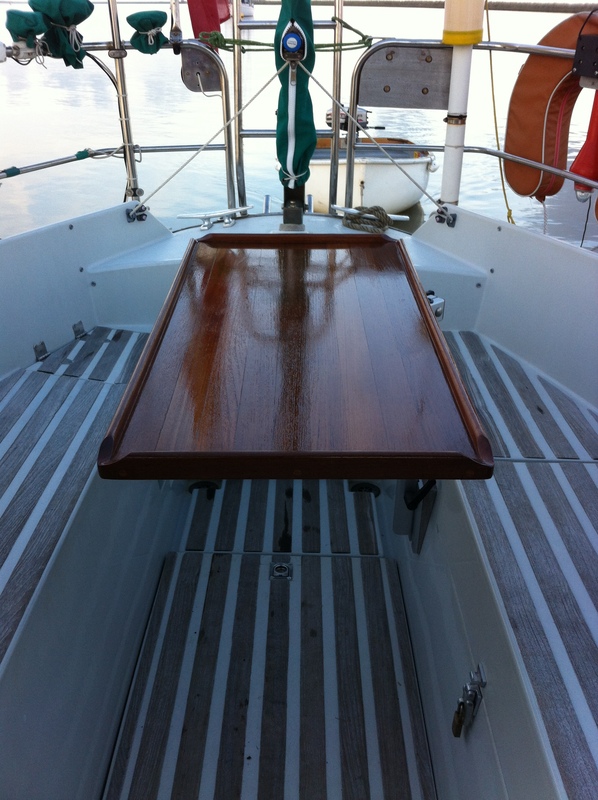 Teak slatted cockpit seats and sole. Rope tidy bags. 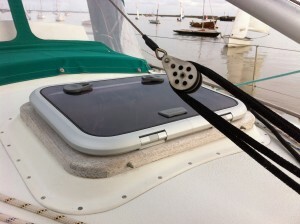 Winch handle pockets. Various warps and fenders. Life Raft. Mahogany cockpit table (new 2009). COMMENTS: – The current owner is a fastidious experienced single hander who has spared no expense since he bought her in 2005. 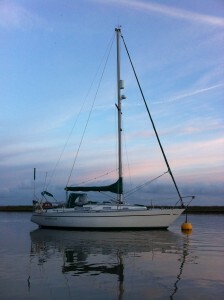 She is set up for short handed cruising in comfort. 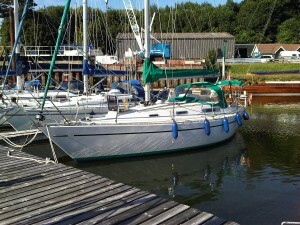 The owner is buying a larger vessel. 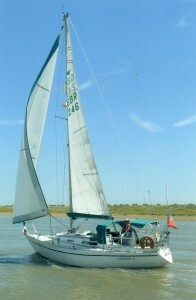 An extremely fine example of a Sadler 32. If I was in the market for a Sadler 32 I wouldn’t hesitate to buy her. 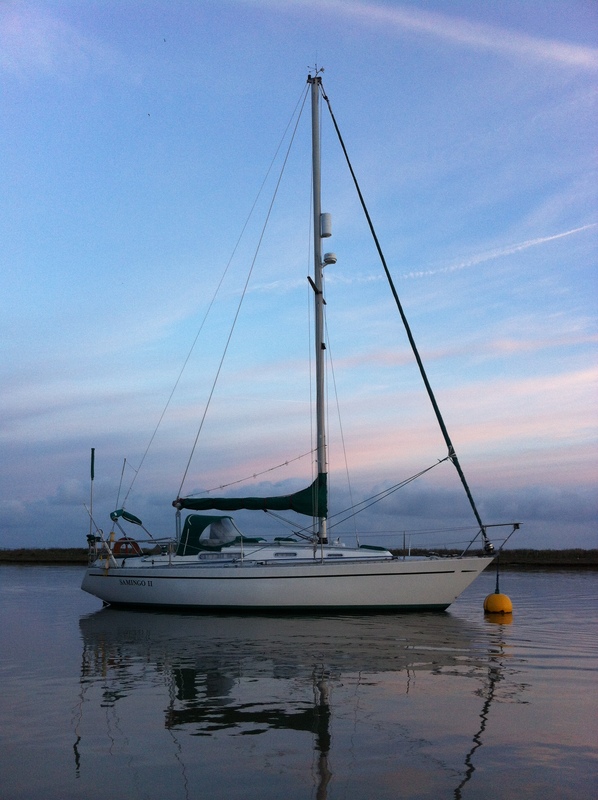 She is a fantastic sea boat and almost certainly the best example in her class.